Ottawa – The Ottawa 2017 Bureau and Mayor Jim Watson, in collaboration with lead partner CIBC, are pleased to reveal details about the design and program partners for Inspiration Village. A core site for Ottawa 2017 programming from May 20 to September 4, this ephemeral entertainment locale on York Street will be the site of a succession of FREE special exhibits and performing arts events showcasing Canadian culture and Canada’s provinces and territories. The edgy-looking hub is being built out of 41 sea containers transformed into an aesthetic artistic installation. See the video: https://vimeo.com/215008391. The full list of activities and daily performances on the main stage will be available in mid-May. The public spaces of Inspiration Village will remain open and accessible 24-hours. The site will serve as a gathering place to meet up with friends, to enjoy the sights and sounds of the area, to sit back and enjoy programmed entertainment, to pick up lunch/dinner or coffee/tea in the ByWard Market and to enjoy the outdoor seating areas. 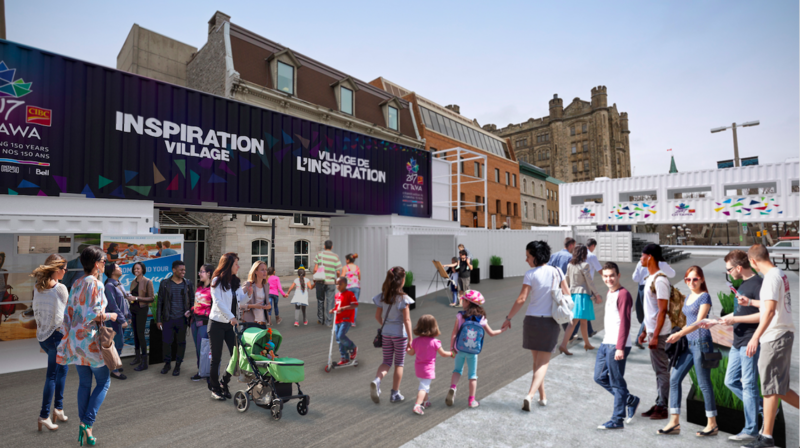 “Inspiration Village will animate the ByWard Market like never before, and will be a gathering point for the millions of visitors who will come to Ottawa this summer. It will showcase the beauty of Canada’s regions and the diversity of Ottawa 2017 partners while entertaining and educating passersby about the people and places that make this country so great,” said Mayor Jim Watson. “The Ottawa 2017 Inspiration Village will offer Ottawans and visitors alike a wonderful opportunity to celebrate Canada 150. I encourage everyone to attend the diverse artistic events being held in the ByWard Market, one of the city’s historic neighbourhoods,” said the Honourable Mélanie Joly, Minister of Canadian Heritage. “What sets Canada and Ontario apart is our rich cultural diversity and inclusive spirit. Inspiration Village is an eco-friendly and innovative way to share with our families and the rest of the world what makes this country such a great place to live, work and visit. We are proud to be part of Inspiration Village with our Ontario150 sea container to help mark the 150th anniversary of Confederation. This is a great opportunity to remind ourselves how much we, as Ontarians, have to be proud of living in Canada’s largest province and the incredible things we can accomplish when we come together,” said the Honourable Eleanor McMahon, Minister of Tourism, Culture & Sport. “Canada’s rich and diverse culture and heritage are the building blocks of our great nation. We are incredibly proud to help bring this showcase of creative talent and expression of shared pride to Ottawa 2017 celebrations,” said Monique Giroux, Vice-President, Sponsorship Marketing & Strategic Partnerships, CIBC. “One of Ottawa 2017’s goals is to foster a better appreciation and understanding of the cultural diversity we find across our country by creating new meeting places for interaction. Through transforming our city with creative urban design, we will emerge from Canada’s 150th anniversary celebrations with a greater sense of pride for reimaging our public spaces. Our appreciation to the Royal Architectural Institute of Canada for suggesting that York Street would make an ideal new public space,” said Guy Laflamme, Executive Director of the Ottawa 2017 Bureau.